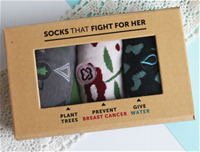 Thoughtfully made socks that fight for global causes. For every pair you buy, a quantified impact goes to our nonprofit partners. Our socks are vegan, organic, FairTrade Certified, meet Oeko-tex standards and really comfortable. Partners include Oxfam, UN Aids, Oceana, Global Citizen & more. Socks that fight for her. Show your support for women around the world with our newest conscious collection: Socks that Fight for Her. Poverty disproportionately affects women around the world, but you can help. Each box plants 10 trees through Trees for the Future, promotes early detection of breast cancer through Keep A Breast, and empowers women with access to safe water through Water.org. Buy as a gift for the women and your life and give a gift that keeps giving! 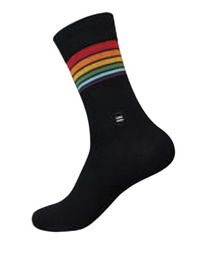 Celebrate love and respect for all with these top selling rainbow striped socks. These socks donate to the Trevor Project to provide crisis intervention and suicide prevention for LGBTQ youth. Each pair is lined with an extra layer of terry in the sole to give you even more comfort and padding. 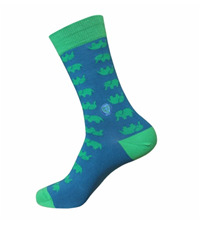 Inspired by the ocean’s many shades of blue, these are the perfect pair of socks to add some fun to your wardrobe! 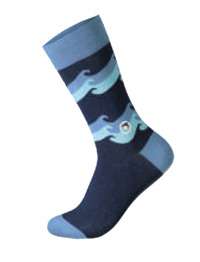 Available in men’s and women’s sizes, each pair of these crew socks donate to Oceana and their work protecting and restoring the world’s oceans. Oh, the places you’ll go! 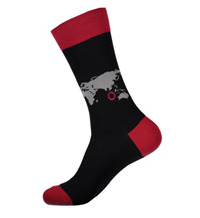 Perfect for the global adventurer, these crew socks highlight a world map with red accents. Take them with you as you wander through national monuments, explore new cities or travel to new countries. Each pair is made with Fairtrade Certified, organic cotton and supports Global Citizen’s work to fight extreme poverty. Our Men’s Basics Gift Box got an update! 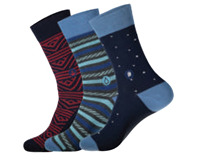 Featuring 3 new pairs of socks, each gift box provides 3 meals through Action Against Hunger, 18 months of safe water through Water.org and 1 book through Room to Read. It provides the basics, but this gift box is anything but basic! Made from recycled kraft paper, each gift box is complete with a magnetic clasp so you can reuse it over and over. Fight poverty and give a gift that gives back.